The outpouring of love and support for sweet Cora is amazing. and woke up to a inbox full of headband and pin orders. The McClenahan's are so loved. I have sold out of the pink headbands, but I didn't want to stop making them. So early this morning I made a new headband and pin set. 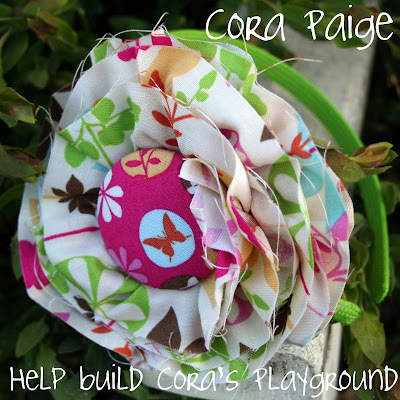 Pop on over to the shop to help build Cora's Playground. Goodness! I didn't act fast enough to get one of the original headbands!! But what a GOOD thing!!! 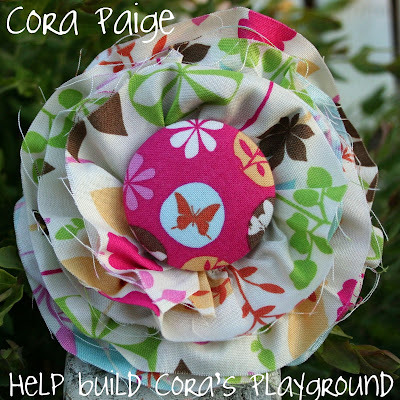 I just came from your shop...each time my sweet girls dawns her beautiful butterfly headband I will be reminded of the beautiful Cora and what an impact her all too short life has made on the world. Thank you for being the amazing, kind hearted person that you are. What a great way to help! What a great idea! I hope you'll be making more headbands as I see you have sold out of the butterfly ones too! What a beautful thing you're doing. Best of all- I found your blog. Fantastic. I can't wait to start reading! I cannot believe how many people have helped!! That is incredible. The Lord is sooo sooo good during this hard time. I have published a post on my blog to link to your blog, in hopes that you will get more donations. Thank you for doing this amazing thing for that family!! What a beautiful idea! I just ordered my pin. I like many others will wear it proudly and remember this sweet girl and her family.